The most energy-efficient lightbulbs are harder to find in low-income communities. One of the easiest ways for a household to save energy and money is to install energy-efficient light bulbs in as many sockets as possible. But, according to a new University of Michigan study, the low-income households that benefit most from these savings have a harder time finding CFL and LED bulbs than do households in more affluent neighborhoods. They pay more money for them, too. For the study, a team led by Tony Reames, assistant professor at the School for Environment and Sustainability and director of the Urban Energy Justice Lab, canvassed 130 stores across Wayne County, Michigan, which encompasses Detroit and surrounding suburbs. Graduate students Michael Reiner and M. Ben Stacey conducted much of the on-the-ground data collection. 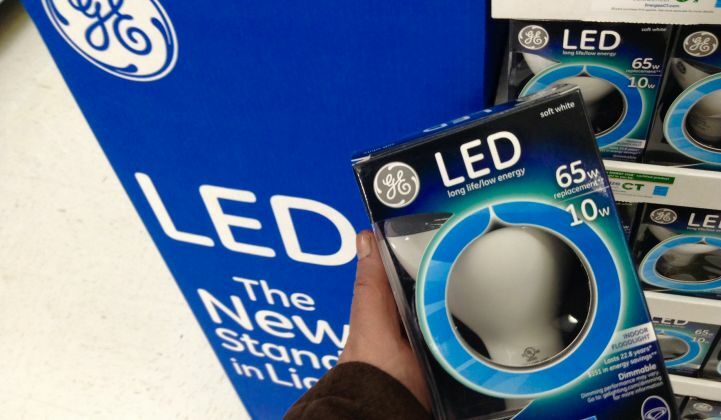 The researchers tracked prices and availability for inefficient incandescent and halogen light bulbs as well as high-efficiency CFLs and LEDs at five store types: large big-box retailers (Home Depot, Walmart); hardware stores; variety stores (Family Dollar, Dollar General); pharmacies; and small retail stores (mini marts, corner delis, and liquor stores). The survey found high-poverty neighborhoods lacked the large retailers offering lower prices and wider selection. CFL and LED bulb prices and availability differed across the county, but more limited availability and higher prices were the norm in high-poverty areas. The most expensive CFLs and LEDs were found at pharmacies and small retail stores located in low-income urban neighborhoods. In the poorest areas tracked in the study, with 40 percent or more of households living below the federal poverty line, none of the small retail stores carried LEDs. Meanwhile, 92 percent of the same stores carried energy-wasting incandescent and halogen bulbs. Researchers found a $6.24 mean price difference between incandescent and halogen bulbs and LED replacements in the poorest areas. Perversely, incandescent and halogen light bulbs were less expensive in the high-poverty neighborhoods. For Reames, the results are a clear example of one of the equity issues confronting low-income families. The study was inspired by the body of research documenting another of those inequalities: the lack of affordable fresh fruits and vegetables in poorer urban neighborhoods. “The ability to benefit from the transition to more energy-efficient lighting is not equitably distributed, and those disparities raise energy justice concerns,” Reames said in a press statement. Lighting accounts for about 20 percent of the average household’s monthly electricity bill. Replacing inefficient incandescent and halogen bulbs with LEDs should be one of the simplest steps a family can take to lower its carbon footprint and save money at the same time. But because low-income households are less likely to have access to personal vehicles, it’s not as easy to comparison-shop for more affordable lighting options. These carless shoppers, as well as those lacking access to public transit, are therefore more likely to depend on nearby stores where LEDs may not even be stocked. An additional disadvantage for low-income households is that in-store utility rebates used to encourage the sale of energy efficient light bulbs are less likely to be found at retailers in high-poverty neighborhoods. “Poorer communities aren’t even able to benefit from this lightbulb rebate or discount program that they end up paying for through their rates,” Reames told Greentech Media in an interview. A study published by Reames’ team last year found that for every $1 spent on utility energy-efficiency programs targeting low-income Michigan customers, up to $4.34 was spent on programs targeting non-low-income customers. More of the energy savings accrued to the higher-income customers, too. The study found that for every 1 kilowatt-hour saved in low-income homes under the energy efficiency programs, up to 22 kilowatt-hours are saved in non-low-income homes. Utilities and state regulators need to ensure equity in lightbulb rebate discount programs. Utilities and other key stakeholders should partner with small retailers in high-poverty neighborhoods to expand access to LED bulbs. Utilities should invest in educational materials and marketing campaigns targeting small-retail store owners and their customers. Reames added that utilities need to do a better job of giving their customers access to information on the availability of energy-efficient lighting. On the website for ComEd, the utility serving Chicago, he said, customers can enter their ZIP code to access a list of nearby retailers that sell discounted LED bulbs. The website for the utility serving Detroit, DTE Energy, meanwhile, just provides a list of participating retailers where in-store rebates are available for LED bulbs. Reames is convinced that lack of access to high-efficiency lightbulbs is not limited to low-income areas of Detroit. “If we assume that because of development and segregation by income and race, and how that influences where stores are located, this could be something that is common in other metropolitan areas,” he said. Fresh Energy, a nonprofit organization based in St. Paul, Minnesota, just published research by environment policy research fellow Jen Fuller that replicated Reames’ study on a smaller scale in the Twin Cities market.